CINCINNATI -- A hearing today that advocates thought would determine the fate of homeless camps in Hamilton County was canceled after lawyers for the city of Cincinnati signed off on Hamilton County Prosecutor Joe Deters' motion to permanently ban all encampments on public and private property countywide. Deters' office filed the motion last week, arguing that encampments on private property were just as much a public health and safety problem as encampments on public property that the court banned a week earlier. 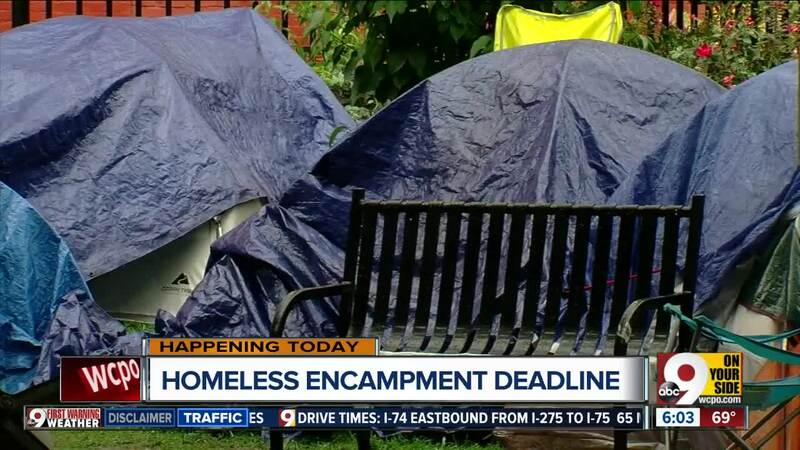 "Essentially at this point in our county if somebody is without a home and is living outside on public land or private land -- even with permission of the owner -- they can be arrested," said Josh Spring, executive director of the Greater Cincinnati Homeless Coalition. The homeless coalition had asked members of the public to pack the courtroom this morning to oppose the ban, but the hearing was canceled before the courtroom doors were opened to the public. Spring said lawyers representing people from the camps in a federal lawsuit would ask the federal court to step in and declare the ban unconstitutional. "The court of public opinion and the federal court are the two places we need to be," Spring said. Homeless encampments in downtown Cincinnati have been in the spotlight since July 16 when city officials gave people staying in tents beneath Fort Washington Way 72 hours to clear the area. The city eventually gave notices to people living in tents pitched on sidewalks along Third Street, too. The people there moved their tents just long enough for the city to clean the area and then set them up again. That's when Cincinnati Mayor John Cranley asked Deters to intervene to help clear the camps, leading to a series of temporary restraining orders that culminated in the countywide ban. Some people from the encampments had pitched their tents on private property in Over-the-Rhine under the belief that they were in compliance with Hamilton County Common Pleas Court Judge Robert Ruehlman's orders. The roughly 15 people remaining at the camp at 13th and Republic streets have agreed to move today so as not to cause problems for Over-the-Rhine Community Housing, an affordable housing developer that owns the property where they have been staying. Spring said two or three people have been able to get into housing, but the remaining people at the camp have nowhere to go. "It's not hyperbole that people are going into hiding," he said. "Folks living outside in Hamilton County both have a need and feel a need to hide from our city and our county." People experiencing homelessness have been camping out in a pocket park at 13th and Republic Streets for about a week, after a judge banned homeless camps from all public property in Hamilton County. "It's harsh out here, man. It's hard out her for everybody out here," said Allen Howard, one of the people living in the camp. 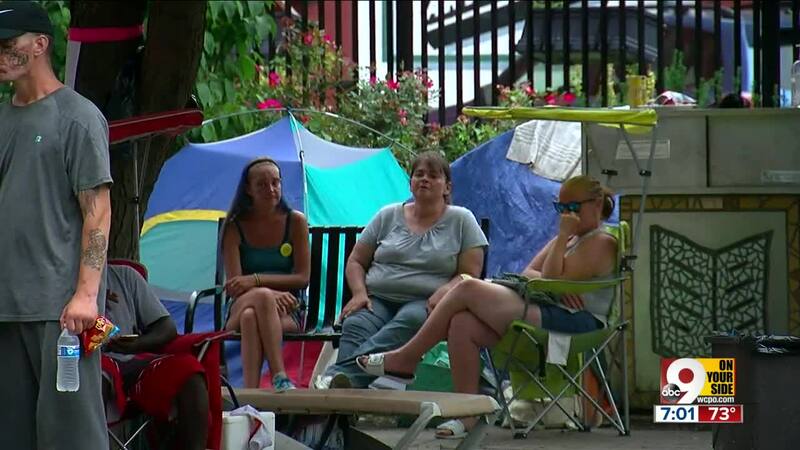 Minutes before they were scheduled to start packing up Thursday, leaders from the Greater Cincinnati Homeless Coalition and Over-the-Rhine Community Housing came up with plan to buy more time to find housing for them. "We understand that this is not sustainable, so collectively we've decided that come Monday, we're going to continue to work through the leadership of Andy Hutzel and others, working with folks to try to find housing and secure housing," said Mary Burke Rivers, the executive director of Over-the-Rhine Community Housing. But Burke Rivers said they weren't sure if they'll be able to secure housing for everyone in the camp by Monday. "We're going to do our best, but there's a shortage," she said. Mayor John Cranley released a statement Thursday saying that police would continue to enforce court orders on homeless encampments. He also voiced support for Over-the-Rhine Community Housing's efforts to find permanent housing for the people in the camp. "We appreciate that commitment and our outreach workers will continue to work with individuals experiencing homelessness to connect them to needed services and housing," Cranley said. Deters had called the camp a civil nuisance and a health risk. He said there are needles at the camp and concerns about the spread of disease like hepatitis. So far at least a few people who had been camping at 13th & Republic have been placed in affordable housing. Advocates are still working to find housing for the rest, not to mention the 450 or so others currently living in shelters in the city. Homeless camps have already been booted off of several pieces of public land Downtown, near The Banks and in Walnut Hills. Some of the people have been asked to move six times now, Spring said. "People are literally in hiding," he said. "They are afraid that armed officers will come and take them away." Over-the-Rhine Community Housing's housing director, Andy Hutzel, previously told WCPO that they had not asked permission, but they would not be kicked out. Deters had said Cincinnati police would clear out the camp and anyone refusing to leave would be arrested for contempt of the judge's order. Representatives from The Colony, Over-the-Rhine Community Housing and the Greater Cincinnati Homeless Coalition released a statement Thursday saying that the people living in the pocket park will leave Monday. "People who have lost their homes and live outside, in spite of being chased by the City and County and not knowing where to go, have decided to respond with courage and compassion and chose to leave this site in order to not jeopardize our collective affordable housing movement," they said in the statement. Deters' comments on the camp Wednesday came shortly after what Spring called a "productive meeting" with attorneys from the city Law Department about policies and housing options for people experiencing homeless. Spring said Deters "has decided not only to chase people with nowhere else to go from public lands, but now is seeking to control what people do with their own private land." "We are deep in an affordable housing shortage of crisis levels," Spring said in a written statement. "The number of people experiencing homelessness in Cincinnati and Hamilton County is the highest it has ever been. Women, men and children living outside, in shelters and bouncing from couch to couch are desperately trying to obtain sustainable affordable housing, but there simply is not enough available. People daily are working with outreach workers and shelter case-manages and going trying to obtain or keep employment all in order to obtain affordable housing." Joseph Mead, an assistant professor at Cleveland State University who teaches both law and urban affairs, called the latest move by Deters "an incredibly wasteful use of government resources, to continue to go after this encampment when they've found a private property owner who is willing to put them up." In addition, the original order is "pretty clear" that it applies only to public spaces, Mead said. "The reason the city was sued is because the city owns the public spaces," he said. "The city is not responsible for any nuisance that occurs on private property because they're not the owner of the property." Mead was among a group of lawyers who filed a letter Tuesday with the court requesting public access to the filings in the homeless camp case and the court's rulings. Mead called the entire case "extraordinary" because it involves two parties that want the same thing instead of an adversarial plaintiff and defendant. "It's troubling to me that the county prosecutor sought and obtained this extremely broad order that applies to everyone's behavior in all public spaces across Hamilton County, and the average person cannot access the scope of the order or the evidence that supports it or the arguments that were made," he said. It's also "bad policy" to threaten people with arrest for being homeless and living outside, Mead said. "There's a lot of research that shows that threatening people for trying to survive, that does not work," he said. 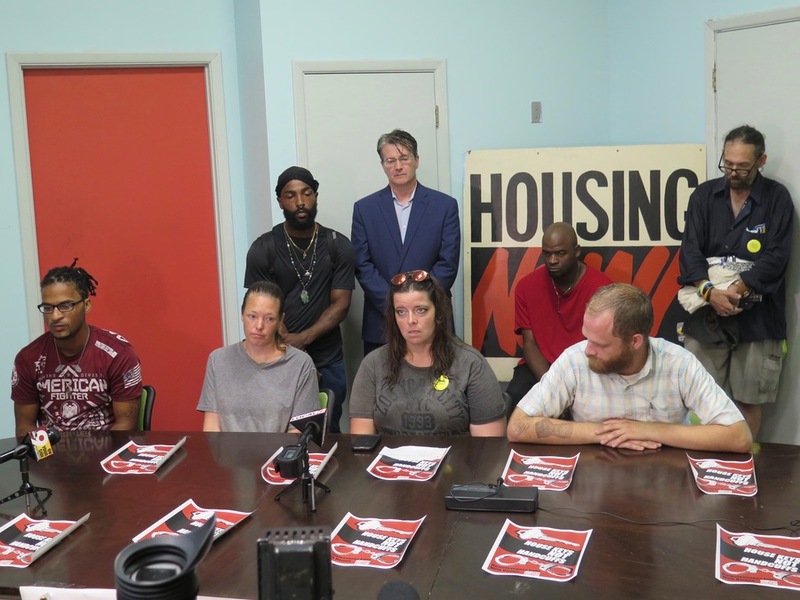 At a Wednesday afternoon news conference at the Greater Cincinnati Homeless Coalition's offices in Over-the-Rhine, Spring said the people who have been staying at the camp weren't sure what they would do. Spring and Bennett Allen, an attorney representing the people from the encampment, said they both were under the impression that Hamilton County Common Pleas Court Judge Robert Ruehlman's orders applied only to public property. "It seemed very clear and obvious," Allen said. "We weren't trying to be cute or slick or anything like that. We were trying to find a place that complied with the order so people could be found and services could be provided." A woman who goes by her nickname Sunshine has been staying at the encampment with her husband, who goes by Darkness. She said at the news conference that they have received a housing voucher but have not yet found a place to live. 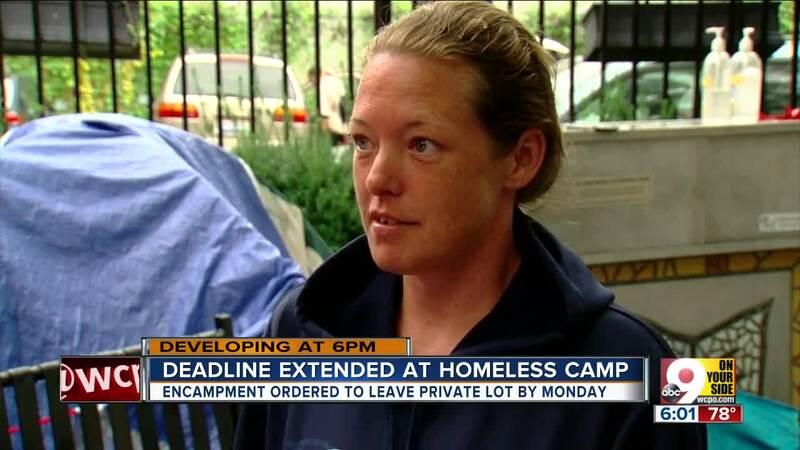 "To be told I can't go camping or sleep outside is unbelievable," she said. "I can't even believe that we're in America and this is happening." 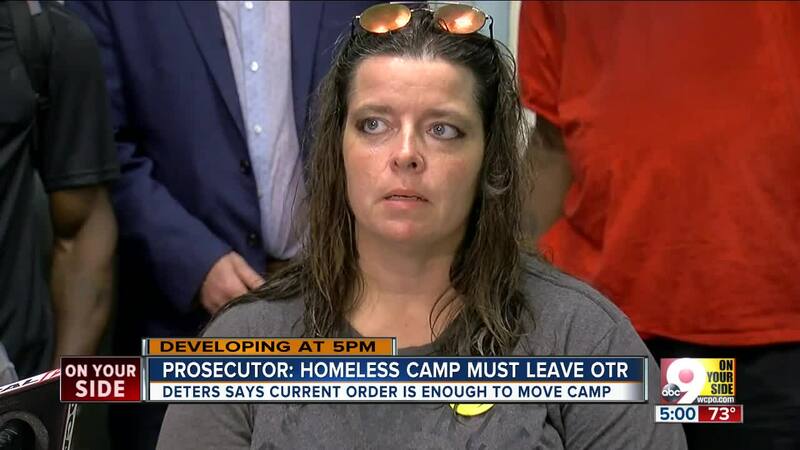 She urged members of the public who disagree with Deters' actions to sign an online petition , asking Cincinnati Mayor John Cranley and Deters to "stop their attacks on encampments of people experiencing homelessness on public and private property." "We have to come together," Sunshine said. When asked what the people still staying at the camp planned to do at noon tomorrow, she replied: "Maybe Deters would like to invite some of us over?" 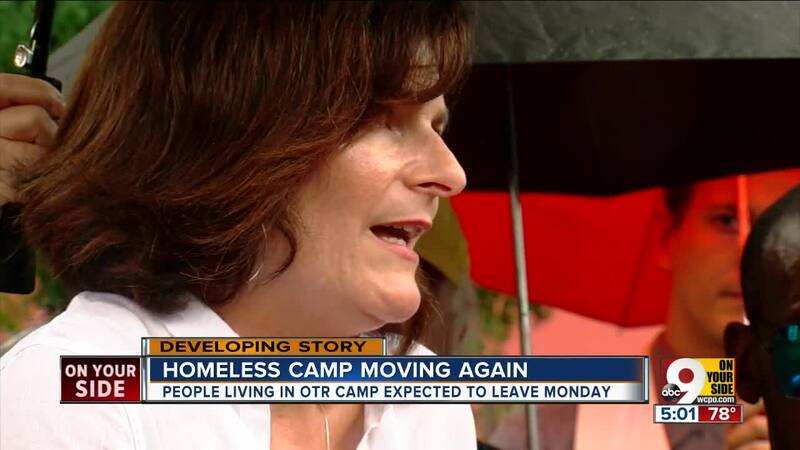 Spring stressed that Deters' plan to dismantle the camp should concern everyone, whether they are homeless or not. "They're trying to tell each of us what we can do in our own spaces," he said. "Not only our own public spaces but our private spaces." Even so, he said lawyers for the people at the camp would continue to work with lawyers from the city to negotiate a settlement to the federal lawsuit filed on behalf of the homeless. "We have attempted to lay out for the city ways that people sleeping outside could have quicker and more reasonable access to housing," Spring said. Everyone at the camp has applied for housing, Sunshine said, but the question is whether any of them will end up in jail before they can find apartments.